I was excited about going to see my first match of the season. This would be a perfect opportunity to wear my sun-hat without the usual sense of shame associated with over-keen headgear. Although its powers are potent, it didn’t prevent pre-match embarrassment on the trains. I caught the eye of a busker at Monument Station. The hat could not prevent the subsequent blushing and awkwardness. I also saw three grown men play with a remote control car in a car park. They were displaying the sort of dedication that the building of mighty, pink beer-bellies requires. I also attempted to buy a pair of cheapo sunglasses in the Kennington Tesco. It failed me. I suggest you boycott Tesco when purchasing your fashionable shades in the future. I noticed that many previous correspondents voiced a preference for pies. I was determined not to eat pie. It was summer; it was sunny; it was hot. This was not pie weather. Maybe a salad? Or an honest sandwich even. The one saving grace was the pie-monger’s resemblance to an old work colleague. Every Monday morning, we would gather around her office with our plastic cups of coffee as she regaled us with stories of her weekend’s sexual adventures. Her tales, if matter-of-fact in their delivery, were vivid and precise in their detail. We would all try to empathise as we reflected on our own weekends of half-completed DIY projects and trips to the supermarket. We used to wonder whether there was a bloke, in some other part of London, providing an equally meticulous account. He was probably sitting behind me. He shouted a lot. 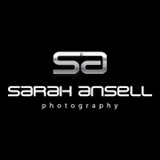 “Eh-ssex! Eh-ssex! EH-SSEX!” he would say. Sometimes, he would forget the rest of the words. Those moments were like buttered bliss. In any case, I got very sunburnt. I also saw a nice aeroplane. What kind of pie is that? On first inspection, I thought it to be a large gobbet of lasagne — CLEARLY not cricketing scran. Is that the minced beef one? that’s my least favourite, of the Oval pies. When Stuart Law played for the mighty Eagles, there was a fella who sat behind me singing.. It was OK if Law was out early doors, but that don’t happen too often, so it went on and on and on. I loved that song, now it makes me want to stab faces. There’s rather too much cricket visible in that pie photograph – almost a breach of King Crciket etiquette if I am not mistaken. Quite curvey in appearence, the Oval pie. 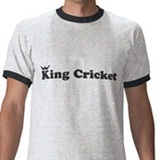 The irony of the Oval pie being, well, oval, and the Lord’s pie being square is probably not wasted on many King cricket readers. I shall as you suggest boycott Tescos for shades. Can I buy cheese there though? I think the Atheist’s Pie is where I sat last year for a county championship against Durham. 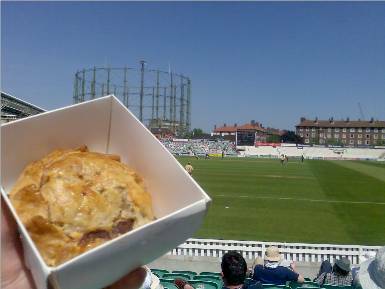 it’s rather apt (poetic even) that the pie at the Oval is slightly elliptical. Looks a good pie too. On Saturdays there is a little market in the church yard opposite Oval tube. There is good pie to be found there. Gedd Ladd: missed your comment. Great minds and all that…. I saw a nice aeroplane once. jrod, did it leave you? they always do. just as you think you’ve settled down to look at a nice aeroplane for the rest of your days and all of a sudden it’s gone, nothing but a fickle and emotionally bereft vapour trail in it’s place. For future reference, I would be grateful for guidance as to the criteria that differentiates a common aeroplane from a nice one. Size? Shape? Markings? Wing walkers? A tiger moth containing David Gower? I’d hate to look a fool next time I’m at the cricket and the conversation turns to the skies overhead. BTW, you know what doesn’t leave you? boats! Ooh, Ne, I also highly recommend that farmers’ market; I go there all the time. I saw a double-rotor chinook helicopter in the sky as I left work yesterday. TAKE THAT, PLANESPOTTERS. I used to work near you Mims, I reckon. I was based in Ropemaker Place, and they used to make my building shake, whenever they landed in the Barracks next door. The shake was probably the reason they knocked my builiding down. Miriam: oooo, get us with our La-De-Dar bijou farmers markets. Ne, you’ll never be allowed back above the watford gap, now you’ve owned up to that! I know! I’m going to make a run for it tomorrow evening though, as I have to go sit in the rain in Old Trafford this weekend. I shall wear my northern uniform of a flatcap, whippet and blackpudding to confound the guards at Watford Gap. It’ll be the like the great escape. He’ll say “jolly poor weather for may what?” and I’ll say, “why yes old bean, it’s frightful” and with that I’ll be rumbled and put to death. … that or just go up the M40. Ne, black pudding is revolting. Someone on the OBO once described it as a “spiced scab”, and I simply can’t think of a better description. Oi! We’re metropolitan up here in t’north you know and serve our black pudden with a foam sauce now – so its spiced scab and spit doncha know. I’ve just read that while eating my dinner, Miriam and Ceci. Thank you. Hmmmmm, black pudding. Truly the scab-like food of the gods. More blood in food stuffs please.